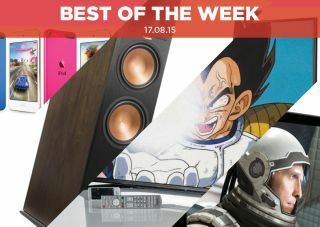 Best of the Week: Sony Xperia Z4 tablet review, Apple iPod Touch refresh and more… | What Hi-Fi? A round-up of the news and reviews to have graced What Hi-Fi? this past week – featuring products from Apple, Klipsch, Panasonic, Sony and more. This week Neil Young threatened to take his music off streaming services, Apple refreshed its iPod Touch line with improved specs and Klipsch unveiled a new series of dedicated Dolby Atmos speakers. It was a good week on the reviews front with Sony's Xperia Z4 tablet, Panasonic's TX-50CX802B 4K TV and Tannoy's Kensington GR speakers the best of the bunch. Neil Young says no to streaming due to "worst sound quality in history"
Unimpressed by what he calls "the worst quality in the history of broadcasting", Young plans to remove his back catalogue from music sites such as Spotify and Apple Music due to the music being offered in compressed form rather than hi-res. For Young, this is an issue about convenience over sound quality. Is he right or just cranky? MORE: Neil Young says no to streaming due to "worst sound quality in history"
Apple has refreshed its iPod Touch line, with the 6th-gen models now sporting faster chips, more storage and a range of new colours. The iPod now features the same A8 chip as the iPhone 6, and the same 8 megapixel camera found on the iPad Air 2. The update also comes with iOS 8, paving the way for Apple Music. A 128GB option is available for the first time, and the Touch comes in five colours: space grey, silver, gold, pink and blue. Dedicated Atmos speaker configurations have been thin on the ground but Klipsch is set to add to the number available with its Reference Premiere Dolby Atmos speakers. The range is made up of three models: the RP-280FA floorstander, the RP-1405A module speakers and the RP-450CA centre channel. All of the speakers feature Klipsch's Tractrix Horn technology, which the company claims will allow the speakers to "meet the directivity and sensitivity specifications that Dolby requires for Dolby Atmos-enabled speakers". UK pricing is still to be confirmed. "The Pana is as good as they get"
Panasonic wowed us with its TX-40CX68OB 4K effort. Now we have the TX-50CX802B, and it's another fantastic TV. If you're looking to upgrade to 4K, this is a good TV to take the plunge. 4K content is crisp but the Full HD performance impresses most. This TV is excellent at upscaling, rendering HD content with terrific detail and clarity. A negative? The smart remote isn't the most responsive, but aside from that there's little to fault. This is an impressive TV for both 4K and Full HD performance. "The Kensington GRs are speakers to love"
Looking like they've been transported from the 1950s, Tannoy's Kensington GRs are old fashioned in appearance, but the performance is absolutely spellbinding. There's a sense of ease at how it communicates large dynamic shifts, and enough bass and insight to make for a stunning audio experience. At £10,000 they're not cheap, but the Kensington GRs are a very appealing pair of speakers. "At last, a real competitor for the iPad"
Apple has been relatively untroubled in the 10in tablet market, but that could be about to change with Sony's latest tablet. The Z4 packs a screen that's beautiful to look at, has hi-res audio support and plenty of features, including the ability to play PS4 games on the tablet. The build isn't quite up to Apple's standards and the OS could do with a refresh, but this is an excellent tablet and one of the finest Android efforts we've seen.